It's not just our business, its our passion. TRUTCO is unmatched by any other lawn care service or company in Jacksonville. With our monthly lawn care service we will prepare treatments on site, right at your home, to make sure your turf gets the attention it needs to look its very best. 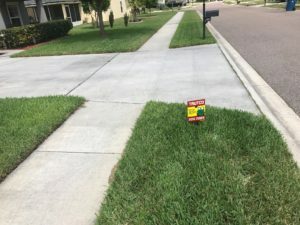 The “pre-printed” approach that many of our competitors use has led to poor customer satisfaction, poor results, and has given the entire lawn pest control industry a bad name. We give our customers personal attention and are the most responsive lawn care service in Jacksonville. Each month, we will mix a treatment based on turf color, thickness, insect populations, disease presence, weather conditions, time of year, and weed varieties. We will contact you before each treatment and use your feedback in the next days application. Listening to our customers helps us solve and prevent problems fast, while we are there, the first time. Our lawn care service includes everything needed to maintain your lawn for one low straightforward price. Unlike our competitors, we don’t charge extra for necessary insecticide, fungicide, crabgrass, or sedge treatments. We charge less per application, show up more frequently, and contact you before each service. 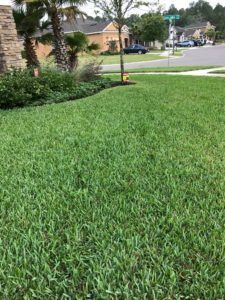 Because we are a small Jacksonville based company, we are able to better train and empower our lawn care technicians to evaluate and make decisions in the field regarding what lawn treatment will be administered that day. It is not only our mission to make your lawn look great, but also to be easy to do business with. Trutco’s monthly lawn care service has no contracts. Our service is results driven. We don’t make false promises, and long term relationships are our goal. We will always tell you the truth and we are going to do whatever we can to keep you 100% happy. A great looking lawn requires a strong partnership between the homeowner and lawn service provider, therefore we will leave detailed lawn specific notes each service. Get a free lawn specific quote below today! We are applying another round of fertilizer, broadcasting a weed treatment and insecticide for spring annual weeds in your lawn. Last month we applied a granular fertilizer to help your lawn recover from dormancy. That application will continue to feed your lawn this month. As temperatures are more consistently 80 degrees during the day and 60 degrees at night lawns will begin to actively grow and improve in color as a result. This month we are broadcasting a weed treatment to help treat weeds in lawns that are not yet dense enough in areas to prevent weed growth. This treatment will treat weeds, turf destroying insects, and help your lawn continue to improve in color. Mow frequently enough to keep from removing 1/3 of the leaf tissue. In March, you should have adjusted your irrigation to twice each week. Now is also a good time to check coverage as May is typically the driest month of the year in Jacksonville. Water each zone for 45 minutes twice each week from March through November. Watering for a longer duration (45 minutes – 1 hour, rather than 20-30 minutes per zone) will encourage deeper root growth. Mowing at 4 inches will also encourage a deeper root system. If anything unexpected happens we are always here to help you troubleshoot any issues that may arise. Good cultural practices are going to prevent common problems from occurring in your lawn. If you live in Jacksonville, you know proper watering & regular mowing practices are critical to keep your lawn healthy and green. Here are some basic tips to help you maintain your turf this winter. Continuing watering twice each week as needed in periods without heavy rain. Each zone should run for approximately 45 minutes to 1 hour. The objective is to put out 3/4″ to 1″ of water per irrigation. Check our links for up to date weather and rainfall for your zip code. Proper watering is critical to keep your lawn healthy so adjust your irrigation with rainfall and fungus presence. Be sure to check coverage regularly because a uniform spray is very important. 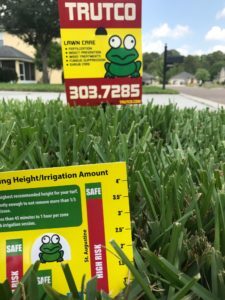 JEA offers free irrigation assessments for Jacksonville residents. If your lawn had dry or hot spots, then it may be necessary to hand water to account for any weakness in your irrigation system. Proper mowing is the largest contribution a homeowner will make to a successful weed management program. Remember to mow high; 4″ lawns are always GREENER, prevent more weeds, and have stronger roots than 3″ lawns. Maintaining your lawn at 4″ will enhance our pre-emergent weed control applications, improve turf density, and shade necessary light from reaching the soil for weed germination. Trutco is the best lawn care service in Jacksonville because we have the best customers in Jacksonville. Working together is key to our success.